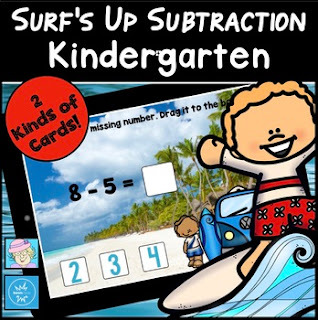 Surf's up for some subtraction! Your littles will love practicing subtraction facts with this FREE deck! It has students finding the difference for each subtraction problem. Students will either click on the correct number or drag the answer to the space. Only minuends of less than 10 are included. It comes with fun beach sounds! Students can also click on the sound icons to hear the directions. It's perfect to use over break to prevent the summer slide! CLICK ON THE LINK FOUND ON PAGE 4 OF THE DOWNLOAD TO GRAB YOUR RESOURCE! *****READ MORE ABOUT BOOM CARDS: Boom Cards are self-grading, DIGITAL resources. They will play on modern browsers (released in the last three years) on interactive whiteboards, laptops, desktops, Chromebooks, and tablets. Boom Cards apps are also available. Not sure your browser is modern enough? Try a free Boom Cards deck first. When you redeem your purchase, Boom Learning opens an account for you if you do not already have one. For TpT customers new to Boom Cards, Boom Learning will give you a FREE 3-month trial that includes student progress monitoring. Starting January 1, 2018, the free trial will be 150 students for 3 months. At the end of the trial period, you may renew or choose not to renew. If you do not renew, you will be able to continue using Boom Cards with the Fast Play feature. Fast Play does not track individual progress. ***Did you know??? You can use Boom Cards in Google Classroom™! Just CLICK HERE to find out how!